Bob at http://www.disasterstuff.com/ gave me a book called Preserve It Naturally published by Excalibur Food Dehydrators. It’s the most wonderful book on dehydration, I have ever found. I did get a smaller book with my Excalibur but it wasn’t detailed like this one. It goes step by step on “how to dehydrate fruits, vegetables, meats, poultry, herbs and nuts and even dairy and grains.” I have been looking for a book that is this detailed. Sometimes I am carried away with how to books, but this is one that I can truly say has it all and we will be using for a long time. 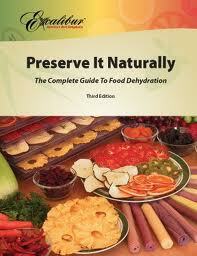 Preserve It Naturally, The Complete Guide to Food Dehydration, has a lot of recipes that I plan on using. There is one for flax crackers, that I especially want to try, it sounds very simple. The book provides you with an approximate time for drying after determining the humidity in your area. There’s a section on making vegetable powders, I have never heard of this before. There good for soups and seasonings. You dry them and put them in a blender, mix until its powder and store them in plastic or glass contains. Also a lot of vegetable and fruit leather recipes. I never realized how great a dehydrator was or what it could do until I got my Excalibur and this book makes it even better.. I would recommend that you get one. It’s great. This entry was posted in books, food storage, Preparedness Mom, recipes and tagged Excalibur, Preparedness Mom, Preserve It Naturally. Bookmark the permalink. I just recently bought my 9-tray Excalibur dehydrator and I believe this book came with it. If you don’t have a dehydrator get one asap. If you are thinking about getting one go and get one. No really, open a new browser tab and buy it. Here are the list of reasons why I love mine. 1) Large quantities of shelf-stable foods for very little money that will last a very long time. I have more fruit and vegetables than I know what to do with. 2) Absolutely 100% natural (depending on pre-treatment and source). You take the food in it’s natural form, cut it up, dry it, and store it. You know EXACTLY what is in it (and not in it). I couldn’t believe the burst of flavor in my mouth the first time I ate one of my homemade raisins. I’ve never had a raisin from a box that had anywhere near the flavor of these things, and that was only the beginning. Strawberries, pineapple, banana, omg! They’re SOOOO good. 4) It encourages to me buy local organic, which in reality, is nothing but a good thing. When deciding what to buy I have “purity” and “natural” going through my head because I know that what I’m dehydrating will probably be given (or sold) to friends and family. Local organic isn’t more expensive, the chemical food grown halfway across the world has to be cheaper in order to feed the masses. If people expect “fresh” strawberries in December you’re going to have to settle for imported stuff that has to be sprayed in order to be cost effective. Just think about that. If your local grocery store refused to stock strawberries in December, how do you think most people would react? They would be mad that they couldn’t get their strawberries. Strawberries in December is expected now, it’s business. Immediately after sharing my first few batches of fruit with friends and family I was being asked if I would sell them product. I didn’t have to do anything but make the capital investment of the dehydrator which costs less than most smart phones and tablets these days. The idea of being able to do something I was doing anyway and get people to pay me for it makes me smile. I have decided to take the next step and purchase a high quality home vacuum sealer (vacupack, not foodsaver) so that I can create small snack sized packaging for my product. It will also dramatically increase the shelf-life of everything I dehydrate. Save the money, buy a really nice one, don’t go cheap, you’ll regret it. You have a heating element and a fan that will typically run between 10-30hours straight depending on where you live. That costs money. Not a lot of money but it’s money. If you’re only drying 2 or 3 trays at a time (which turns out to be a lot of food for 14inches x 14inches of space per tray) there’s no reason at all to buy the 9-tray. I bought the 9-tray because I didn’t want to be limited, well I’m not, by far. They aren’t quiet. The fan runs all the time, which makes total sense. Just keep in mind where you’re going to run it. My trays are dirty every time I use them, especially after fruit. As they dry the liquids tend to move through the holes and along the plastic support material of the tray. It doesn’t drip on the other food below it but it just creates a sticky “glue” that goes between the plastic sheet and the tray underneath. Things that are already mostly dry like a sweet potato won’t create much of a mess. You’re not supposed to put the trays in the dishwasher because they could melt but I found the idea of hand washing the trays every time I wanted to use the dehydrator a little off-putting, though it won’t be bad if you have a sink that can hold a 14x14inch pan. I place my trays and plastic mats into the RINSE cycle only. It uses a little hot water but not enough to cause any warping and there is no dry cycle so there’s no chance of melting. They typically come out “clean enough” for the next batch. Go buy a good dehydrator. Now. If you can’t tell I like mine. A favorite site of mine is Dehydrate@store.com. Tammy has videos, recipes and tips on using her Excalubur dehydrator. Sorry, the site is dehydrate2store.com. Can’t seem to type and hold a baby at the same time! I bought my Excallibur over 30 years ago and it’s still going strong. Some of the mesh has cracked but not bad enough to have to buy replacements. You can dehydrate just about anything – my latest experiment was left over chili. It turned out great.